In my "war on aging" I have done a lot of research and tried many different products. I tell you all about the ones I like and why. I recently had the opportunity to try Joyal Beauty Age Defy Serum. First, let me say that I am really happy that this is 100% vegan and all natural. My skin is sensitive and I didn't experience and redness or irritation, only soft smooth, radiant skin. I am very pleased with that. In all of my reading and trials I've learned that one of the most important weapons in fighting aging skin is exfoliation. 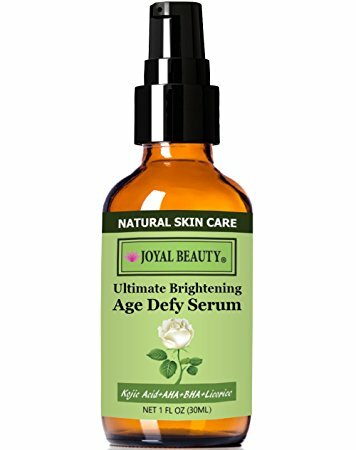 This serum contains Glycolic Acid which brightens the skin and Willow Bark / Salicylic Acid which helps acne prone skin or oily skin with blackheads or whiteheads. This is a natural anti-aging exfoliant reveals youthfully radiant skin and reverses sun damage. It helps to reduce fine lines, improve skin's texture, even skin tone, and stimulate healthy collagen production. Packed with Vitamins A,B,C,and E this is real nourishment for your skin. Not only does it help with Rosacea,Acne, Inflammation and Dark Spots, it also increases skin plumpness, firmness and evens your skin tone. I am really happy with the results that I'm seeing and I wanted to share that with all of you.